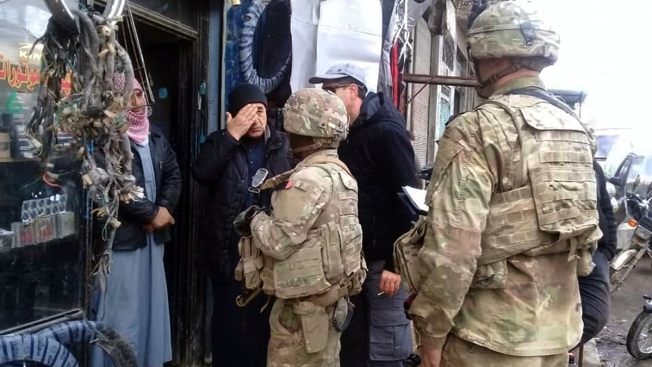 This photo released on the Facebook page of the Military Council of Manbij City, shows U.S. troops based around the Syrian town of Manbij speaking with residents, in northern Syria, Sunday, Dec. 23, 2018. Turkish-backed Syrian fighters are preparing to deploy in eastern Syria alongside Turkish troops once American forces withdraw, a spokesman said Monday, adding that his forces have begun massing on the front line of a town held by Kurdish-led forces. U.S. President Donald Trump has said the withdrawal from Syria will be slow and coordinated with Turkey, without providing a timetable. Turkey said the two countries are coordinating to ensure there is no "authority vacuum" once the U.S. troops leave. A Kurdish-led force captured much of northern and eastern Syria from the Islamic State group with the help of the U.S.-led coalition. Turkey views the Kurdish fighters as terrorists because of their links to a Kurdish insurgent group inside Turkey. Youssef Hammoud, of the Turkey-backed Syrian opposition forces, said their fighters and weapons have been deploying on the front line with Manbij, a Kurdish-administered town in northern Syria where U.S. troops are based. On Monday, Turkey's state-run Anadolu Agency reported that Turkey-backed Syrian forces had moved closer to Manbij, equipped with heavy weapons and armored vehicles. Manbij was at the center of an agreement the U.S. and Turkey reached in June under which Kurdish forces were to withdraw. In recent weeks Turkey had said the U.S. was dragging its feet in implementing the deal and had vowed to launch a new offensive against the Kurds. Those threats, and a phone call with Turkish President Recep Tayyip Erdogan last week, appear to have triggered Trump's decision to withdraw all 2,000 U.S. forces based in Syria. Hammoud said there is "no alternative" except Turkish forces and allied Syrian fighters. He said up to 15,000 Syrian fighters trained in Turkey are ready to take part in the operation. He said the initial focus was on Manbij and areas just across the nearby Euphrates River. Hammoud said "we are ready to fight Daesh," referring to the Islamic State group. But the extremists are largely confined to a remote desert enclave hundreds of miles (kilometers) to the southeast of Manbij. Hammoud said they are now preparing to take on Manbij. Deploying to areas to the south will come later, he said. Turkey's armed forces have led two offensives into Syria since 2016 to push Islamic State militants and Kurdish forces back from the border. The Kurdish-led forces still control around 30 percent of Syria, mostly in the east, including some of the richest oil fields. The Kurdish militia has expressed shock at the U.S. decision to withdraw, and now faces a triple threat from Turkey, the Syrian government and IS. Trump has claimed to have defeated IS, but the Kurdish fighters are still battling the extremists in the remote town of Hajin near the Iraqi border. The Syrian Observatory for Human Rights said the fighting displaced nearly 1,000 civilians on Sunday alone. Associated Press writer Suzan Fraser contributed.